Today's lovely debutante is the 2012 Pro, of course, but the Air—who we suspect gave the Pro some serious body image problems over the years—is getting a promotion too. Ivy Bridge, USB 3.0, and speed, speed, speed. 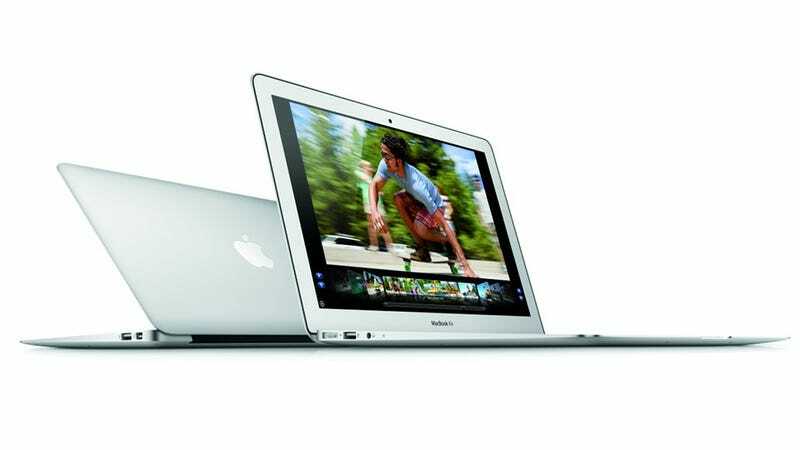 All MacBook Air models will now pack Ivy Bridge processors—up to 2.0 GHz. But in addition to the superfast CPUs, MacBook Airs will start with 4 GB of RAM (sort of the minimum, these days) with the option to blast all the way up to a fancy 8 GB. That much memory combined with Ivy Bridge guts and an SSD will make these things fly: Oh! And that SSD! Now it goes up to a gigant-o 512 GB of space, running at blazing SATA 3 speeds (6 Gb/sec). Some other sweet perks this time around, beyond USB 3.0 inclusion? A beefed up 720p FaceTime camera, a $100 price drop, and they'll ship today. They haven't gotten any smaller or lighter, but, really, how much more could you want? These are terrific little blades. Unfortunately, they're still stuck with AMD integrated graphics. Don't get any delusions about Far Cry 3. Remember when the MacBook Air was an underperforming runt?